Francesco Foschi is still a relatively unknown artist but a series of texts written at the end of the 20th century have cast more light on this figure. Luigi Serra’s investigations in the first quarter of the century were followed by those of Bonfrancesco and Marietta Vinci, in which Foschi’s life and work were set within the context of the art of his native region. As a result his oeuvre has been reconstructed although various issues remain problematic, particularly the dating of his paintings. Foschi, who as a mature painter specialised in snowy landscapes, was from a wealthy family of which various members were painters. He completed his training in the studio of Francesco Mancini in Fano then moved to Rome in 1729. There he was interested in the work of two artists who specialised in urban and architectural views, namely Giovanni Paolo Panini and Gaspar Adriaensz. van Wittel, and their influence is evident in Foschi’s compositions. The artist enjoyed the protection of influential and distinguished figures at the outset of his career such as Count Raimondo Bonaccorsi, and later that of the English ambassador in Naples, Sir William Hamilton. He also had notable French patrons who appreciated his works such as Cardinal Bernis, the French ambassador in Rome, the Count d’Orsay and the Marquis of Rohien. 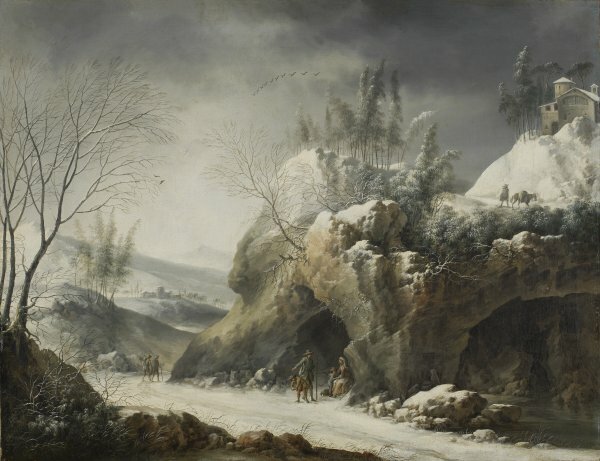 Foschi’s first snowy landscape is now in the Musée des Peintures et des Sculptures in Grenoble. It is signed and dated and refers to the artist’s place of origin. The present pair of canvases entered the Thyssen-Bornemisza collection from the Swiss art market in 1979, both bearing the title Snowy Landscape in the Apennines. The two canvases depict the outskirts of a city under the snow with various peasant figures, some with their livestock. They share various compositional elements such as the path running past a river flanked by rocks and a steep bank with trees on top that creates a bend in the path along which the figures are walking. 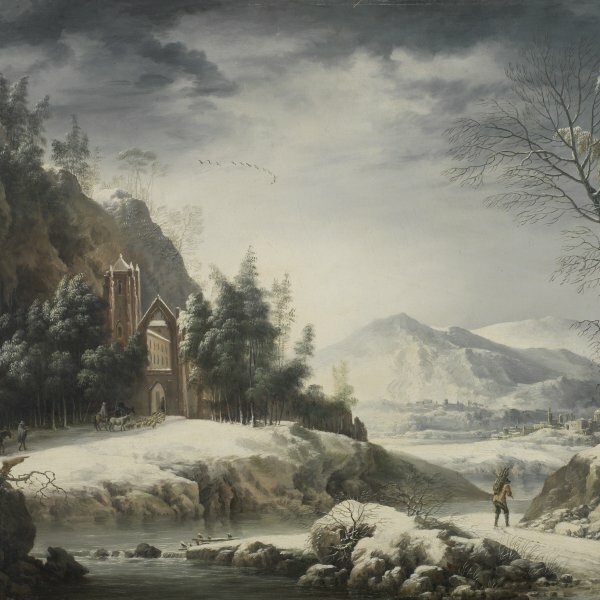 Winter Landscape with Figures features the ruins of a Gothic church among a large grove of trees. In this composition the mountains acquire particular importance although no element in the painting suggests a particular location in the Apennines. The colour range in the two canvases is limited with an emphasis on whites, a carefully studied range of greys, and a few brown and ochre tones that emphasise small areas of ground not covered by the snow. These tones and Foschi’s precise technique are deployed to achieve excellent effects in the treetops, patches of grass, bare trunks and heavy sky. These two canvases have been compared with others that deploy similar devices, albeit within simpler compositions such as the signed painting in Grenoble and another in the Bowes Museum, County Durham.